Debates in church and politics can get painfully polarized, especially when participants hear only from like-minded people. Within our respective echo chambers, voices on both sides of an issue become shrill. We are tempted to demonize others who disagree. Buildings that house the Dead Sea Scrolls in Jerusalem have architecture symbolizing such binary thinking. Underneath a white dome in the foreground are precious scrolls discovered in the desert at Qumran in the mid-twentieth century. The dome is shaped like the lid of one of the jars that stored the famous scrolls for two thousand years. Below the black wall in the background is the entrance to the underground museum. 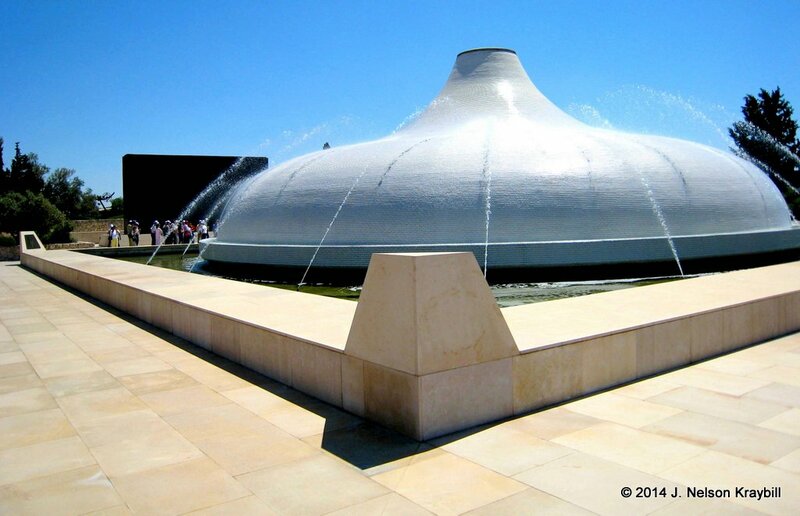 The Shrine of the Book at the Israel Museum in Jerusalem features architecture illustrating dualistic, black-and-white theology. In these and other caves near to the Qumran community by the Dead Sea, Essenes hid hundreds of scrolls before the Roman army destroyed Qumran in about AD 68. In a scriptorium at Qumran, Essenes copied books of the Bible and other literature specific to their movement. After Jews revolted against Rome in AD 66, a Roman army swept through the Jordan valley. 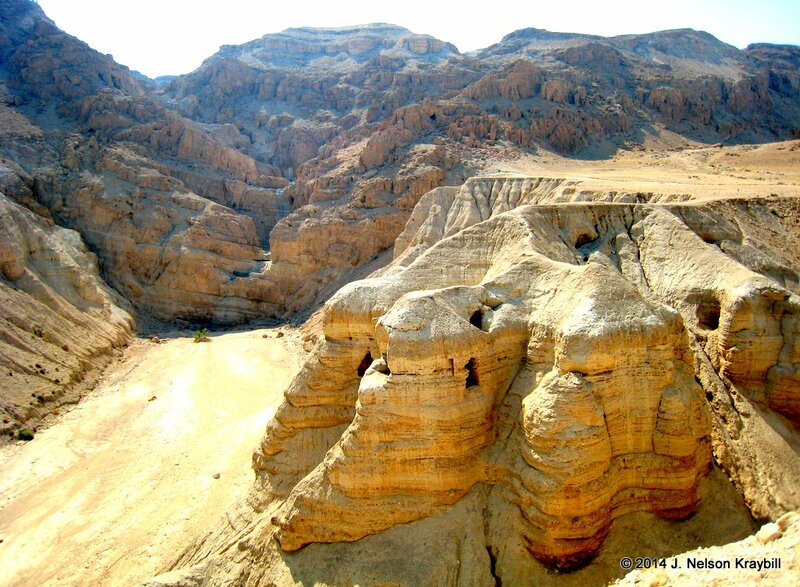 Qumran residents apparently hid manuscripts in nearby caves for protection. Hundreds of manuscripts remained undiscovered until 1946 and following. Suddenly in the modern era scholars had manuscripts of the bible nearly a thousand years older than anything previously available. The scrolls revealed that the Old Testament text we have today is close to what Jews knew in Jesus’ day. Scribes over a millennium had done their copy work well. 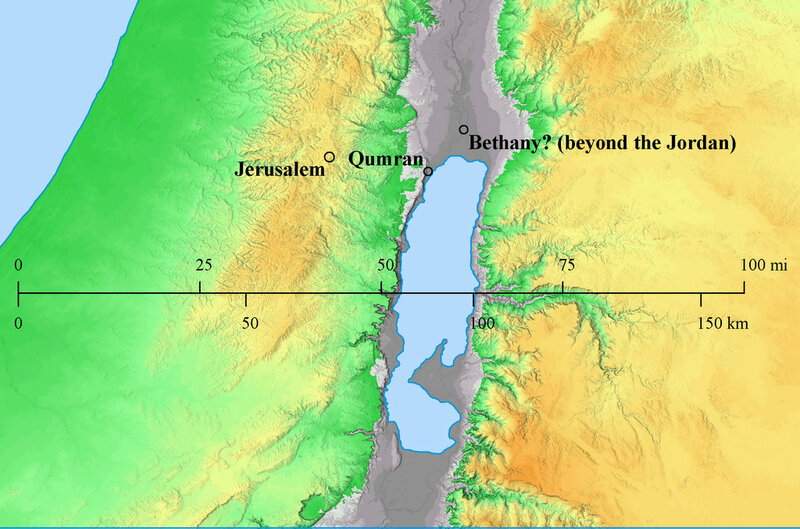 This map shows how close Qumran was to “Bethany beyond the Jordan” where John baptized Jesus (John 1:28). It is possible that Qumran somehow influenced the thinking of John. John the Baptist probably baptized Jesus at Bethany beyond the Jordan—within sight of Qumran on a clear day. He, too, had withdrawn from Jerusalem and had an adversarial attitude toward much that happened there. His theology sounds polarizing (“You brood of vipers!”). Jesus called himself the “light of the world.” But he fraternized with fisher folk, Pharisees, lepers, snobs, poor people, and Roman soldiers. He taught followers to be light in the world, not light withdrawn into an enclave of like-minded people. It is possible to have strong convictions about what it means to walk in the light and still relate in loving and respectful ways with others who see things differently. In this era when faith communities are reconsidering boundaries, the story of Jesus and the early church crossing barriers should get our attention. The magnificent outdoor model of first-century Jerusalem at the Israel Museum in modern Jerusalem includes details that illuminate layers of exclusion that surrounded the first-century temple. On this model of the first-century temple, the fence beyond which no Gentile could pass appears as a grey line immediately to the left and right walls of the inner temple courts. 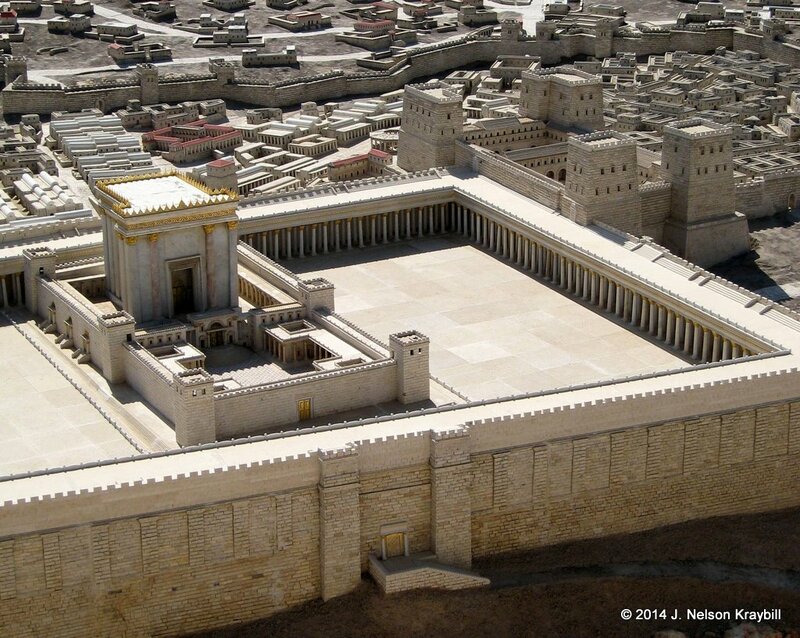 Filling most of this photograph is the spacious “Court of the Gentiles,” which any Jew or Gentile could enter. Along left and right sides of walls around the inner temple courts, however, a fence marks the point beyond which no Gentile could pass. Only Jews could enter the near court (Women’s Court) of the temple complex. Only Jewish men could enter the far court (Court of Priests), and priests alone could enter the Holy Place of the main Temple building. Once a year the High Priest could enter the Holy of Holies. There was a partition made of stone all round, whose height was three cubits [56 inches]. Its construction was very elegant. Upon it stood pillars, at equal distances from one another, declaring the law of purity, some in Greek, and some in Roman letters, that “no foreigner should go within that sanctuary” (Josephus, Jewish War 5.193-194). It was across this physical barrier that vigilant fellow Jews thought Paul had brought a Gentile named Trophimus. Among few identifiable archeological remains we have of the ancient Temple is this fragment from one of the warning signs that Josephus describes. 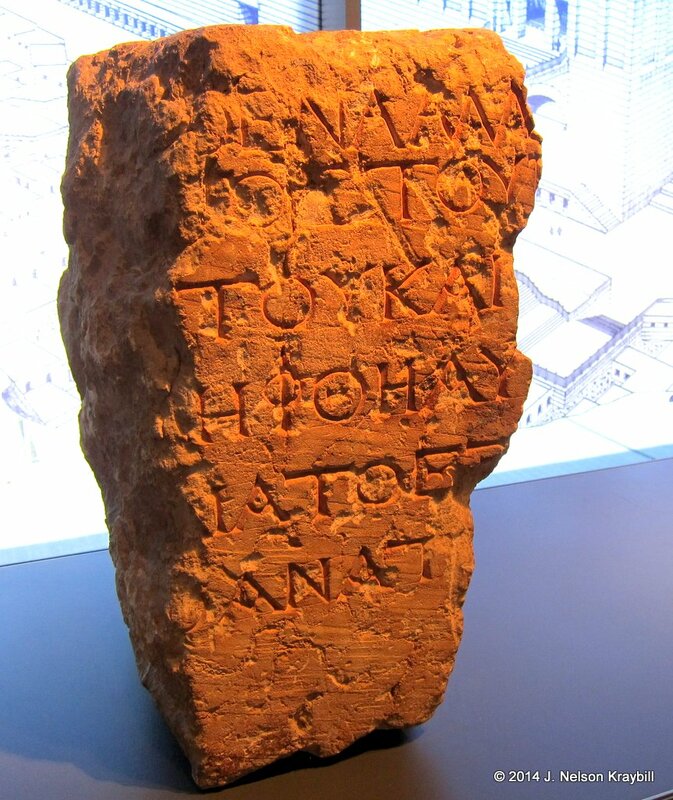 This fragment of a temple warning sign is at the Israel Museum. We know the full text of the sign because a complete version is at a museum in Istanbul. The full text read read: No foreigner shall enter within the forecourt and the balustrade around the sanctuary. Whoever is caught will have himself to blame for his subsequent death. At risk of being lynched by fellow Jews, perhaps including followers of Jesus, Paul was arrested by Roman soldiers. Likely they were dispatched from Antonia Fortress, the four-towered barracks at the far corner of the Court of the Gentiles in the model. Paul faced various charges brought against him by fellow Jews. He eventually appealed his case all the way to Rome, where he apparently suffered martyrdom during Nero’s crackdown on Christians after the great fire of AD 64. Paul risked his life to bridge the gulf between Jew and Gentile. May the same Spirit that guided the early church to cross boundaries inspire and direct faith communities today that wrestle with the tension between tradition and inclusion.